Glenumbra is the western peninsula of High Rock separating the Iliac Bay from the Eltheric Ocean. The peninsula's geography is a mix of rugged woodland and fetid swamps. Snag-weevils have been known to plague the area, and werewolves are particularly prevalent. The famed city of Daggerfall is found along the coast of the southern region of Daenia. The forests of Daenia give way to the Cambray Hills, the central region of Glenumbra, which is home to the city of Camlorn and the marshland of Hag Fen. Farther north is King's Guard, which takes it name from the mountain range which separates Glenumbra from Stormhaven and Rivenspire. 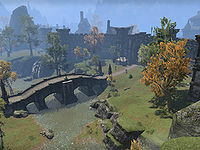 Numerous other settlements are scattered throughout Glenumbra, such as Crosswych, a town in eastern King's Guard along the land route to and from Daggerfall. The peninsula is home to Cath Bedraud, the great cemetery where monarchs of High Rock are interred, as well as Glenumbra Moors, the site of the famous Battle of Glenumbria Moors. This page was last modified on 16 April 2019, at 16:00.